Using the distinct geochemical properties of pyrite from a range of deposit types, we attempt to maximize the use of drill core samples to determine potential ore deposit type and estimate their relative proximity to mineralization for vectoring purposes. 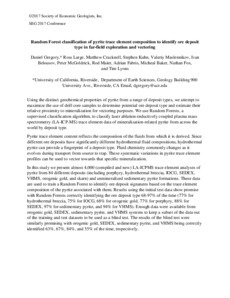 We use Random Forests, a supervised classification algorithm, to classify laser ablation-inductively coupled plasma mass spectrometry (LA-ICP-MS) trace element data of mineralization-related pyrite from across the world by deposit type. Pyrite trace element content reflects the composition of the fluids from which it is derived. Since different ore deposits have significantly different hydrothermal fluid compositions, hydrothermal pyrite can provide a fingerprint of a deposit type. Fluid chemistry commonly changes as it evolves during transport from source to trap. These systematic variations in pyrite trace element profiles can be used to vector towards that specific mineralization. In this study we present almost 4,000 (compiled and new) LA-ICPMS trace element analyses of pyrite from 84 different deposits (including porphyry, hydrothermal breccia, IOCG, SEDEX, VHMS, orogenic gold, and skarn) and unmineralized sedimentary pyrite formations. These data are used to train a Random Forest to identify ore deposit signatures based on the trace element composition of the pyrite associated with them. Results using the initial test data show promise with Random Forests correctly identifying the ore deposit type 68-97% of the time (77% for hydrothermal breccia, 75% for IOCG, 68% for orogenic gold, 77% for porphyry, 88% for SEDEX, 97% for sedimentary pyrite, and 94% for VHMS). Enough data were available from orogenic gold, SEDEX, sedimentary pyrite, and VHMS systems to keep a subset of the data out of the training and test datasets to be used as a blind test. The results of the blind test were similarly promising with orogenic gold, SEDEX, sedimentary pyrite, and VHMS being correctly identified 63%, 67%, 84%, and 55% of the time, respectively.